Being pulled over for a traffic violation can greatly disrupt your daily routine and cause a loss of valuable time, not to mention the cost of the fine resulting from a traffic ticket. While traffic tickets are often deserved, there are many occasions in which a traffic ticket is given with a higher charge and fine than deserved. Hiring an experienced traffic ticket attorney in Las Vegas can be of great benefit. A reputable Las Vegas traffic ticket attorney has the knowledge and experience needed to fight unjustified and excessive traffic tickets. A traffic ticket lawyer is also able to represent you legally in court working to prove your innocence. Having a reputable traffic ticket attorney represent you can result in a reduced charge and reduced fine. CEGA Criminal Law offers superior traffic ticket defense dedicated to fighting over-reaching traffic tickets and helping you to save money or even save your license. Why Should You Fight A Traffic Ticket? More often than not, people choose to blindly pay the traffic ticket fine and move on rather than fight the case in court. The convenience of this option might be worth the money because you won’t have to spend time in court or bear the inconveniences of fighting a case, but it can also result in other consequences. Challenging a traffic ticket in court will not only save you money, it can also prevent excessive points being added to your driving record and in some cases can even prevent you from losing your driver’s license. A traffic ticket can also result in significantly raised insurance premiums, costing you even more money in the long run. When you simply pay the ticket, you are essentially admitting to the crime and admitting that you deserve the associated consequences. By hiring an experienced Las Vegas traffic ticket attorney, you will be able to prove your innocence or at a minimum reduce the charges against you. A traffic ticket attorney will do more than show up to court to present your case. 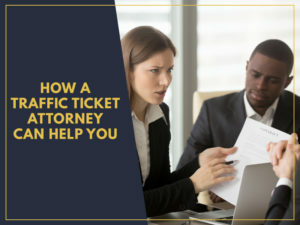 A traffic ticket lawyer will have the knowledge needed to advise you on the strength of your case and then work to prove your case before a judge. A traffic ticket lawyer can help you to dismiss the charges against you or at least reduce the charge and fines. Their representation will prevent points from being added to driver’s record, avoid an increase in insurance rates, prevent a loss of driving privileges, and avoid time consuming consequences such as court mandated driving school. You should be careful when hiring a traffic ticket attorney. Be sure to hire someone with specialized experience in dealing with traffic cases. A local traffic ticket lawyer will have an understanding of the local court system and will be able to represent you more efficiently. An experienced lawyer will have a firm grasp of the complexities of the local traffic law, working it to your advantage. A local traffic ticket attorney will also be able to communicate appropriately with court officials and prosecutors, helping to secure a deal and increase the probability of a positive outcome. Contact CEGA Criminal Law today for superior representation from an experienced Las Vegas Traffic Ticket Lawyer.